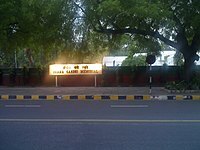 Indian Prime Minister Indira Gandhi was assassinated at 9:30 a.m. on 31 October 1984 at her residence in Safdarjung Road, New Delhi. She was killed by her bodyguards Satwant Singh and Beant Singh in the aftermath of Operation Blue Star, the Indian Army's June 1984 assault on the Golden Temple in Amritsar which left the Sikh temple heavily damaged. Operation Blue Star had a wide impact on politics in India as many Sikh youths joined the Khalistan movement. Indira Gandhi was unpopular among Sikhs due to her role in the operation, which had destroyed and damaged portions of the Akal Takht and caused massive casualties among Sikh pilgrims. Sikh sensibilities were also offended at the alleged entry of army personnel with boots into the temple complex and the alleged destruction of Sikh scriptures and manuscripts in the temple library that caught fire due to explosives used during the operation. Such claims and other rumours led to an atmosphere of mistrust towards the government and ended in a conspiracy to assassinate Gandhi. This occurred within four months of the conclusion of the operation. The perception of threat to Gandhi's life increased after the operation. Accordingly, Sikhs were removed from her personal bodyguard by the Intelligence Bureau due to the fear of assassination. However, Gandhi was of the opinion that this would reinforce her anti-Sikh image among the public and strengthen her political opponents. She ordered the Special Protection Group to reinstate her Sikh bodyguards, including Beant Singh who was reported to be her personal favorite. The spot where Indira Gandhi was shot down is marked by a glass opening in the crystal pathway at the Indira Gandhi Memorial. At about 9:20 a.m. Indian Standard Time on 31 October 1984, Gandhi was on her way to be interviewed by British actor Peter Ustinov who was filming a documentary for Irish television. She was walking through the garden of the Prime Minister's Residence at No. 1 Safdarjung Road in New Delhi towards the neighboring 1 Akbar Road office. She passed a wicket gate guarded by Satwant Singh and Beant Singh, and the two men opened fire. Beant Singh fired three rounds into her abdomen from his .38 revolver, then Satwant Singh fired 30 rounds from his Sten submachine gun after she had fallen to the ground. Both men then threw down their weapons and Beant Singh said, "I have done what I had to do. You do what you want to do." In the next six minutes, Border Police officers Tarsem Singh Jamwal and Ram Saran captured and killed Beant Singh. Satwant Singh was arrested by Gandhi's other bodyguards along with an accomplice trying to escape; he was seriously wounded. Satwant Singh was hanged in 1989 with accomplice Kehar Singh. Salma Sultan gave the first news of the assassination of Indira Gandhi on Doordarshan's evening news on 31 October 1984, more than ten hours after she was shot. It is alleged[by whom?] that Gandhi's secretary R. K. Dhawan overruled intelligence and security officials who had ordered the removal of Sikh policemen as a security threat, including her assassins. Beant Singh was one of Gandhi's favorite guards whom she had known for ten years. Satwant Singh was 22 years old when he assassinated her and had been assigned to Gandhi's guard just five months before the assassination. Gandhi's blood-stained saree and her belongings at the time of her assassination, preserved at the Indira Gandhi Memorial Museum in New Delhi. Gandhi was taken to the All India Institutes of Medical Sciences in New Delhi at 9:30 a.m., where doctors operated on her. She was declared dead at 2:20 p.m. The postmortem examination was conducted by a team of doctors headed by Tirath Das Dogra, who stated that 30 bullets had struck Gandhi from a Sterling sub-machine gun and a revolver. The assailants had fired 33 bullets at her, of which 30 had hit; 23 had passed through her body, while seven remained inside. Dogra extracted bullets to establish the identity of the weapons and to correlate each weapon with the bullets recovered by ballistic examination. The bullets were matched with respective weapons at CFSL Delhi. Her body was taken in a gun carriage through Delhi roads on the morning of 1 November to Teen Murti Bhavan where her father stayed and where she lay in state. She was cremated on 3 November near Raj Ghat, a memorial to Mahatma Gandhi, at an area named Shakti Sthal. Her elder son and successor Rajiv Gandhi lit the pyre. Over the next four days, thousands of Sikhs were killed in retaliatory violence. The Justice Thakkar Commission (headed by Justice Manharlal Pranlal Thakkar) of Inquiry set up to probe Indira Gandhi's assassination recommended a separate probe for the conspiracy angle behind the assassination. The Thakkar Report stated that the "needle of suspicion" pointed at R. K. Dhawan for complicity in the conspiracy. Satwant Singh and alleged conspirator Kehar Singh were sentenced to death. Both were executed on 6 January 1989. A Punjabi movie titled Kaum De Heere (translation: People's Diamonds) highlighting the role/lives of the two guards that assassinated Indira Gandhi was set to be released on 22 August 2014, but was banned by the Indian government. ^ a b c "25 years after Indira Gandhi's assassination". CNN-IBN. 30 October 2009. Archived from the original on 4 November 2011. Retrieved 5 September 2011. ^ "Assassination in India: A Leader of Will and Force; Indira Gandhi, Born to Politics, Left Her Own Imprint on India". The New York Times. 1 November 1984. Archived from the original on 15 October 2009. Retrieved 23 January 2009. ^ "1984: Assassination and revenge". BBC News. 31 October 1984. Archived from the original on 15 February 2009. Retrieved 23 January 2009. ^ "1984: Indian prime minister shot dead". BBC News. 31 October 1984. Archived from the original on 17 January 2009. Retrieved 23 January 2009. ^ a b "Operation Blue Star: India's first tryst with militant extremism - Latest News & Updates at Daily News & Analysis". Dnaindia.com. 5 November 2016. Archived from the original on 3 November 2017. Retrieved 29 October 2017. ^ a b c d Smith, William E. (12 November 1984). "Indira Gandhi's assassination sparks a fearful round of sectarian violence". Time. Archived from the original on 3 November 2012. Retrieved 19 January 2013. ^ "Questions still surround Gandhi assassination". Times Daily. New Delhi. AP. 24 November 1984. Retrieved 19 January 2013. ^ "The riots that could not be televised". Indianexpress.com. 3 November 2009. Archived from the original on 5 December 2009. Retrieved 31 March 2015. ^ "We the eyeballs : Cover Story – India Today". Indiatoday.intoday.in. Archived from the original on 15 December 2014. Retrieved 31 March 2015. ^ Hazarika, Sanjoy (28 March 1989). "India Releases Stinging Report on Gandhi's Death". The New York Times. Archived from the original on 7 November 2017. Retrieved 5 February 2017. ^ Nelson, Dean (30 January 2014). "Delhi to reopen inquiry in to massacre of Sikhs in 1984 riots". The Telegraph. Retrieved 3 May 2016. ^ Chawla, Prabhu (15 April 1989). "Thakkar Commission report leak: Govt try to accuse Arun Nehru of being the main culprit". India Today. Retrieved 30 October 2018. ^ "Centre blocks release of controversial film on Indira Gandhi's assassins 'Kaum de Heere'". The Times of India. Mumbai. Times News Network. 21 August 2014. Archived from the original on 21 November 2014. Retrieved 31 March 2015. ^ "Film on Indira Gandhi's assassins barred from release". The Tribune. Chandigarh, India. Press Trust of India. 21 August 2014. Archived from the original on 3 March 2016. Retrieved 31 March 2015.